Case Packing and End of Line Automation is one of the fastest growing and most diverse applications of modern automation technology. The importance of preparing finished goods in an efficient and cost effective manner for delivery to the distribution channel, has never been greater, than in today’s global economy and markets. Case Packing using corrugated paperboard as the packaging material can be divided into four main key technology categories. Below is an outline of those technologies. Feel free to browse and get more information on each on of them. Not sure which technology to choose or need more information? Please don't hesitate to Contact Us at any time. We are here to help! For line speeds less than 10 cases per minute, it’s sometimes difficult to justify high level full automation. Manual case packing is the best place to focus your dollars. By applying simple low-cost semi-automatic case forming technology, it’s possible to reduce labour. These types of systems often pay back in less than 6 months while also improving the ergonomic situation in the process. At speeds up to thirty (30) cases per minute, top load provides superior versatility for packaging both rigid and flexible products into RSC’s, Display Trays or die cut, one piece wraparound formats. 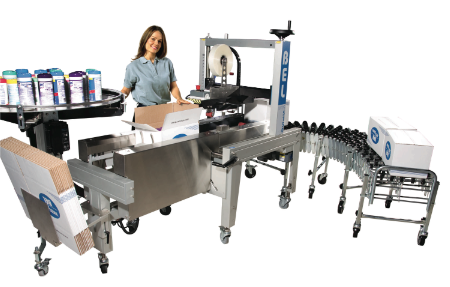 While available in module format with separate cells for case/tray erection, product collation and loading, and case sealing, the high cost of production real estate has seen the evolution of single cell solutions where all three functions are performed on one machine frame in much less space than required by modular systems. Product collation and loading remain the most customized areas of this automation. Multi-axis gantry or robotic loading is now the preferred technology for loading most products. The majority of top load solutions operate with intermittent motion. Generally, side load technology has been how most of the high speed, multi-national consumer products have been packaged. Capable of achieving speeds in excess of seventy-five (75) cases per minute in continuous motion format, the majority of these high speed applications use the one piece, die-cut wraparound case style with hot glue sealing. As speeds increase, so do the complexities of the product handling elements required to prepare the product for loading. As with top load, the majority of the customized engineering in the design of these machine is focused on the infeed and product conditioning area. Mechanical line shaft and cam designs are still popular in some areas of the side load market but increasingly manufacturers are converting their designs to all electronic motion control. Servo technology, the most precise and repeatable approach to motion control was once only available at a premium cost. Today, not only are servos the best solution , they are in many cases, the most cost effective solution. Considered, “old” technology, drop packing was for decades, the technology of choice for packing rigid plastic, glass or composite containers into per-made RSC cases or trays. While still in wide use for beverage products, the use of gravity has been eclipsed by a more controlled approach to product loading. Drop packers are traditionally very large, mechanically driven and require more maintenance than modern alternatives. Their advantage has traditionally been cost, they are generally less expensive than a comparable, modern, top load solution. Popular in the publishing and dairy industries, bottom loading requires the advance preparation and collation of the entire case load while a case is registered and staged above the product. Limited to a maximum of fifteen cases per minute, many of the traditional applications for this technology have been converted to one of the more modern and popular alternatives. Douglas Machine Inc. is North America’s leading manufacturer of servo motion controlled, paperboard, corrugated and shrink-film packaging solutions.